The other day while we were having a conversation Nikolai asked me whether I've played the Pac-Man game before. I am certain that I have seen the game, but I'm really not much into video gaming. I've heard that it was, and perhaps still is, quite popular. I decided to try creating a Pac-Man lunch for him. It was quite easy to make, I used a circle cutter to shape a sandwich topped with a slice of mild cheddar cheese and then removed a sector to create the Pac-Man. I used my Japanese bento cutter for the ghosts but you can also use a small ghost cookie cutter from your Halloween cutter collection if you have one. They are bite sized mini sandwiches, two were topped with fruit leather and the other with provolone cheese. I also included some orange and apple slices and in the other section there are some cucumber slices cut with my crinkle cut knife. To the far right I included a mozzarella string cheese. 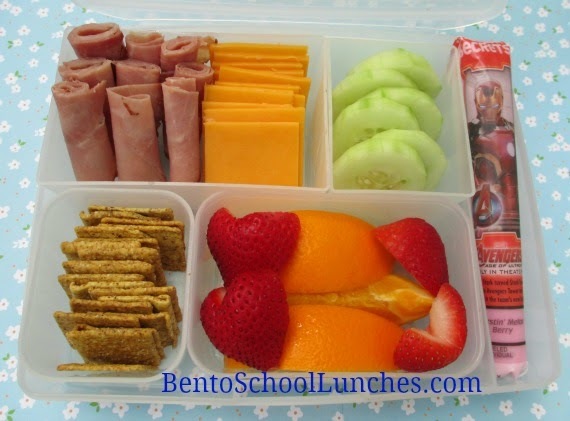 Here is a simple bento which Nikolai enjoyed on a different day. I had no idea as what to pack that day and went with some foods that I had on hand. Looked like lunchables to me, thus the title. He had rolled up honey ham, cheddar cheese slices, cucumber slices, wheat thins crackers, orange, strawberry slices and Yoplait Gogurt. 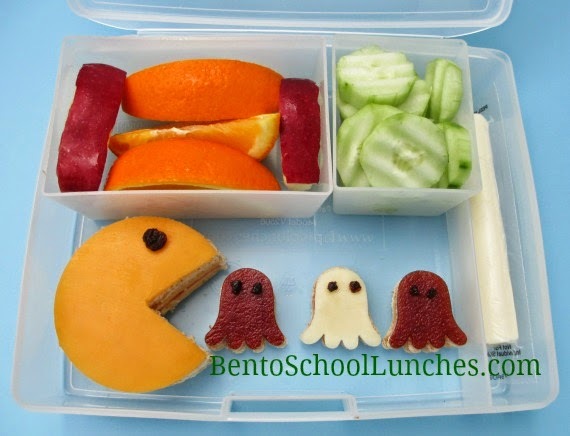 Very cute Pacman lunch and the lunchable looks yummy! Very cute Pacman lunch! Used to be quite popular when I was a young kid. It's been a long time since I saw Pac-Man! This bring back fond memories, I used to play this game! Pacman lunch is so cool!